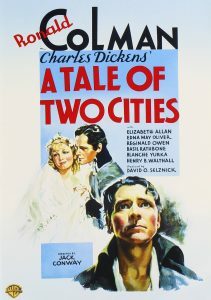 A Tale of Two Cities (1935) “It was the best of times, it was the worst of times….” Charles Dickens‘ tale of love and tumult during the French Revolution comes to the screen in a sumptuous film version by the producer famed for nurturing sprawling literary works: David O. Selznick (David Copperfield, Anna Karenina, Gone with the Wind). 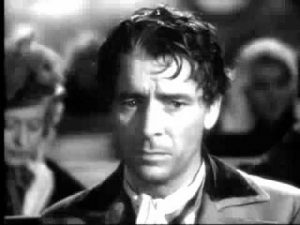 Ronald Colman (The Prisoner of Zenda) stars as Sydney Carton – sardonic, dissolute, a wastrel…and destined to redeem himself in an act of courageous sacrifice. “It’s a far, far better thing I do than I’ve ever done,” Carton muses at that defining moment. This is far, far better filmmaking, too: a Golden Era marvel of uncanny performances top to bottom, eye-filling crowd scenes (the storming of the Bastille, thronged courtrooms, an eerie festival of public execution) and lasting emotional power. Revolution is in the air!